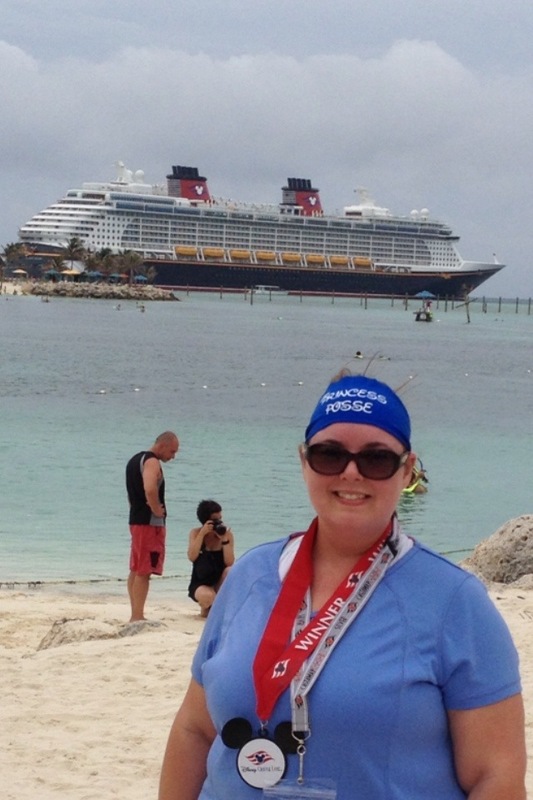 If you’ve been reading along, you know that strangely enough the thing about this cruise I was looking forward to the most was the Castaway Cay 5k. On Tuesday of the cruise, the day had finally come. Castaway Cay is Disney’s private island that most of their cruises sail to. It is gorgeous! The water is so blue, and the sand is pristine! There is plenty to do on the island. There is snorkeling, a sting ray interactive area, water toys, character experiences, parasailing, a glass bottom boat tour, and even a water slide. There is yoga on the adult beach (Serenity Bay), and massage cabanas for those who want to indulge on the beach. Then there is my most anticipated activity, the 5k. Our personal Navigator for the day (a printout that tells you everything that is going on) said we should meet in Evolution at 8:15 am. Running also were my dad, my brother-in-law, and 2 of my nieces. So at 8:15 we signed in, were given our bibs, and Briana (a member of the activities crew) went over the course map with us. We all met in Evolution to get signed in for the 5K. Ok, this is not a great picture but they had the course map on the big screen. 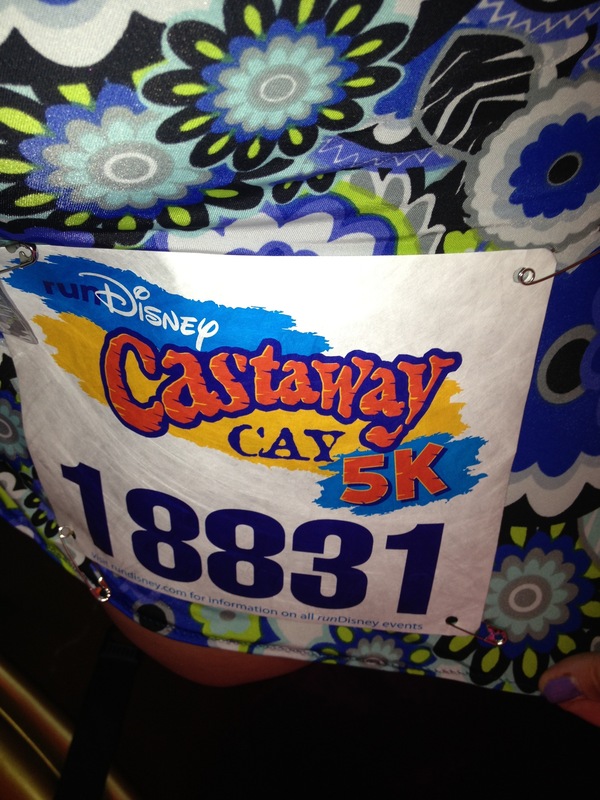 We all got bibs, and they say runDisney! My dad was wearing his t-shirt from the Mickey’s Happy Haunted 5k Trail Run from last year, which got Briana’s attention. She ran the 10 miler last year. When dad told her I ran the 10 miler also as well as Princess this year, she came looking for me. She is planning on running Princess in 2014 as part of the brand new Glass Slipper Challenge. 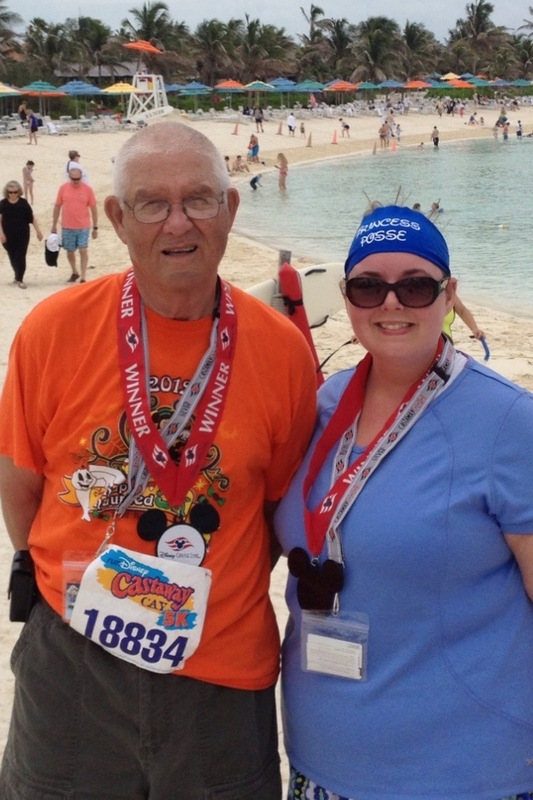 From that point on, she kept calling dad and me her runDisney family. I thought that was really fun. 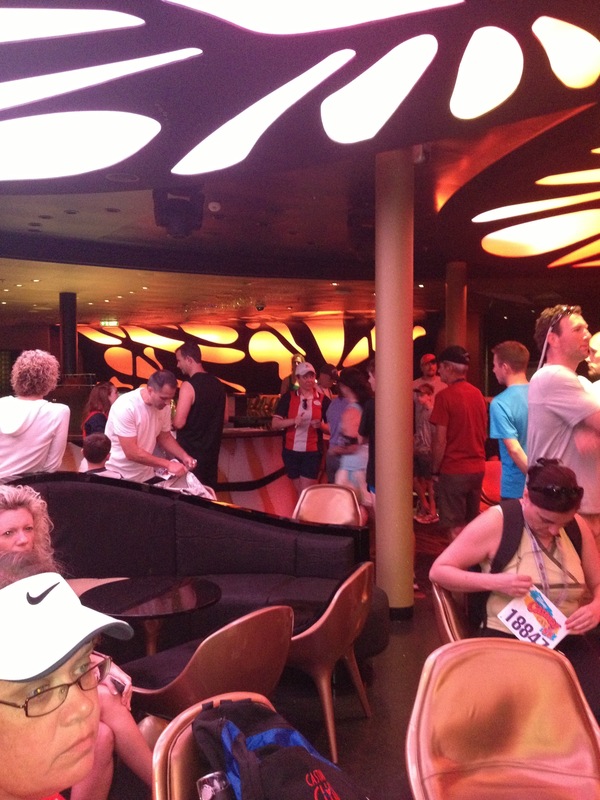 So about 8:45, we made our way as a group to the gangplank to exit the ship. We walked all the way to the second family beach. It felt like a long walk, but that is pretty typical of runDisney races. At one point during the walk to the start, my brother-in-law said, “Is this 5k almost over?” I thought it was a good warm-up, though. I like to walk for a bit before I start running. We got to the start and I had the bright idea to go ahead and buy our 5k shirts. The gift shop is right next to the start. I’ve read that many people have their family members buy them while they are running, and if you wait until you finish they may be out of your size. Since none of our family members who weren’t running were planning on getting off the ship before we would be done, that wasn’t an option for us. So I grabbed the shirts and went to pay, thinking I’d be in and out in 2 minutes. 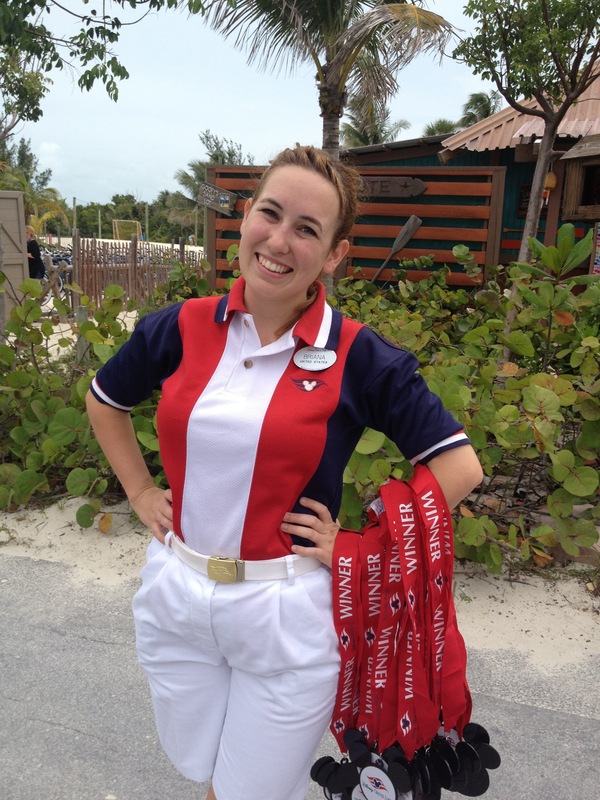 The Cast Member was super friendly and talkative, wanting to know EVERYTHING about our trip so far. I told her we were about to start running and I needed to get to the start. Then she proceeds to tell me ALL the reasons she can’t run. Yeah, yeah, let’s pick this up! I was about to be left behind. She was SUPER careful to make sure they were folded perfectly in the bag, too! Well, needless to say, the other runners took off while I was walking out of the store. They have a box by the start for everyone to put their belongings, and I still had to do that, too. So, not only was I the last one to start, there wasn’t anyone in sight when I started. I wish I had checked the clock at the start to see just how far behind I was, but I didn’t. I’m going to estimate 90 seconds. It wasn’t too long, though, before I was passing people, mainly the walkers. Then I had my dad in sight, who was mostly walking. I wanted to catch up to him, but every time I was almost to him, he would take off running, putting more distance between us. He can actually walk faster than I can walk/run so with him adding some running in, it was almost impossible. Then came the first water stop. Dad was stopped at it, and he spotted me. I stopped to refill my water bottle, and I was sure he would wait on me. But noooooooo! Dad, you’re KILLING me! I’m 38 years old. I’ve been running for a year and a half. I’ve completed 2 half marathons and a 10 miler in the last year. I have on expertly fitted running shoes and tech running clothes. And I’m being smoked by a 69-year-old man who doesn’t run or walk regularly, wearing 10-year-old Reeboks, khaki shorts and a cotton t-shirt. That was a lesson in humility. The course takes you down the air strip, has you make a loop through the 5000 foot long bike trail, finish off the air strip to Serenity Bay, circle back and make another trip through the bike loop, then head home. It’s pretty clear to go counter-clockwise through the bike loop the first time, but for the second loop, some were going clockwise and some counter-clockwise. I was in the clockwise group and met my brother-in-law and one of my nieces heading the other direction. He indicated that he thought I was going the wrong way. I told him I didn’t think it mattered and continued on. At this point I vaguely remembered Briana mentioning that if you do something wrong, it could add a half mile to your trip. I couldn’t remember what that was, and I started questioning myself. The bike loop is marked in feet by thousands in both directions, and I had just passed the 2000 feet mark. I decided to try to estimate another 500 feet and turn around and head back the other direction (remember the bike loop is 5000 feet, so by my estimation I would be at the 2500 feet mark and doubling back would equal 5000 feet). I have no idea how close I was, but I don’t think I could have been that far off. I headed to the finish and the clock said I had a PR by about a minute and 20 seconds. Since it’s not a certified course, I got stared late, and I got turned around, I have no idea how accurate this was. We all collected our medals, and I got a pic of Briana. Briana gave us our medals! We retrieved our belongings and headed to find a spot on the beach for the day. It was really a lot of fun! I kept hearing about how hot this run can get, and it would have been much harder had the sun been out. It was overcast all day, though, with a good breeze blowing. It was very enjoyable. Plus, with this run, I can now call myself an international runner. The experience exceeded my expectations, and if I ever get the opportunity to go on another Disney cruise that stops at Castaway Cay, I will do it again for sure! Have you ever done a 5k on vacation? Where was it? I’m getting ready to go on a Disney cruise aboard the Dream in a couple of months. This will be my second cruise on the Dream, and lately it’s been on my brain a LOT. I’ve been thinking about all the things I didn’t get to do last time that I want to do this time. I’ve been reflecting on what I did last time that I want to repeat. I’ve also just been reminiscing about the last trip in general. 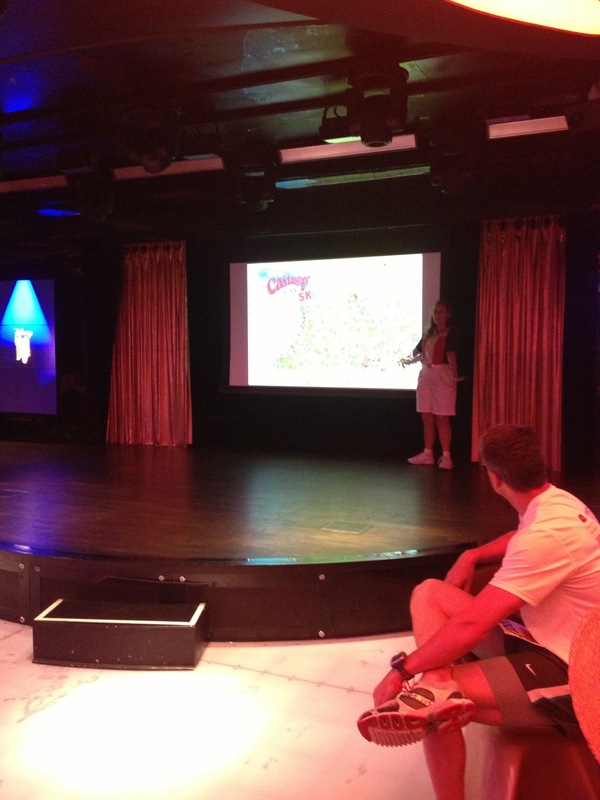 A highlight of most Disney cruises is a trip to Castaway Cay, Disney’s private island. For me, no trip to Castaway Cay would be complete without the famous Konk Cooler. What is a Konk Cooler? It’s only one of my top 5 cocktails (ooooh, future post idea!). I crave the thing, but it’s über fattening so it’s more of a once-a-year treat. No, I don’t go on a Disney cruise once a year (I wish). I have, however, adapted my own recipe from other recipes I’ve found on the internet for it. Blend all ingredients in a blender until well combined. Pour into another container. Add a cup of the mixture back into the blender and blend with enough ice to make it your desired consistency. A cup of the mixture will yield about 2 drinks, and this recipe makes about 5 cups so the total yield is about 8-10 drinks. The leftover mixture (if there is any) will last in the refrigerator for about a week. I added quite a bit of ice to this one because I like them extra thick. I also like to serve it in this fun glass. I think it adds to the tropical feel of the drink. One more thing. I make mine with Tortuga rum that I bought in Nassau on the last trip. I only use that rum for these drinks. I use the golden rum, but light would work, too. The lady in the Tortuga shop who helped me with my purchase told me golden and light rum can be used interchangeably. 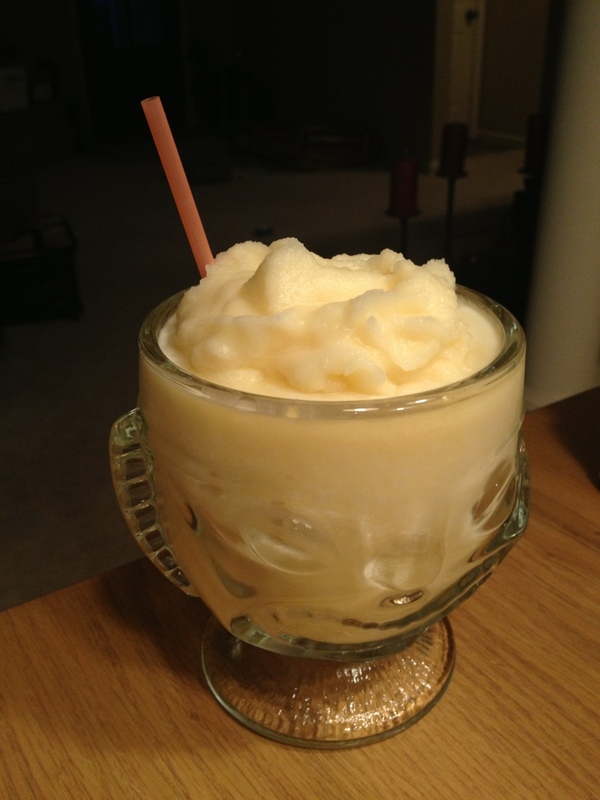 Sometimes I use the coconut rum and sometimes pineapple, but honestly, I can’t tell much of a difference once the other ingredients are blended. Try it out and tell me what you think! If you’ve had the original do you think this comes pretty close?